Once upon a time I worked for a multinational breakfast cereal company as a young food scientist developing new breakfast and snack products. One of the ‘perks’ of the job was the canteen filled with an amazing array of free cereal and milk. As you can imagine, pretty much everyone had their breakfast at work. Including me. But do you want to know something I always found a bit weird? Everyone also had their lunch really early. I mean as soon as the canteen started serving lunch there would be a huge queue. Looking back, I can see now this super early lunch was a sign that our free cereal breakfasts weren’t keeping us full for very long. And now that I understand GI and the whole carbs thing, it makes sense. Anyway, I still love breakfast but these days I don’t head straight to the cereal box. It can be the most easy meal to ‘fall into a rut’ with. So I thought I’d share my current favourite breakfasts ideas and a trick I have to help me avoid the dreaded breakfast rut. It’s simple. I have a little ‘rule’ of not having the same breakfast two days in a row. It’s a small thing, but it’s amazing how it make me keep my breakfast ideas feeling fresh. Ever since I figured out the secret to making beautiful poached eggs, these have been my favourite breakfast eggs. I tend to serve them on a bed of either cooked or raw vegetables. My favourites are raw baby kale leaves from the garden, cooked kale, baby spinach, grated raw cauliflower or grated raw broccoli. I’ve also been getting into making my own sauerkraut which goes really well with poached eggs. Some mornings I add a decadent dollop of home made mayo and a sprinkle of nutritional yeast. But some mornings I don’t. Now that we have chickens, I can wait for them to start laying so I can take my ‘poachies’ to the next level! My Irishman loves fried eggs. And my son Fergal has been having an egg yolk for breakfast most morning for a few months now and he finds the flat shape of a fried egg yolk the easiest to eat. So some mornings we all have our eggs sunny side up. I go for cooked or raw veg as mentioned in the poached eggs above as an accompaniment. Lentils are one of my favourite foods and not just for breakfast! I tend to cook up a pot on the weekends to use as a ‘building block’ for breakfasts and lunches. Some mornings I’ll have just lentils with some flat leaf parsley and a dollop of mayo or some ricotta. Check out my ‘Versatile Lentils‘ recipe if you need some help getting started. A relatively recent addition to my breakfast repetoire, I love these for every day breakfasts with savoury accompaniments as per the recipe below. And for a more decadent weekend treat, I go for the sweet options. Making yoghurt is one of those things that seems really tricky, but in actual fact is super easy and VERY rewarding. For tips on getting started making your own yoghurt, including a coconut yoghurt recipe see this post. I usually have my yoghurt with some lentil or quinoa granola or if I’m out of that just a handful of almonds and sometimes a few fresh berries. If I am having a cereal-like breakfast, its usually more of a bowl of yoghurt with a little granola on top for crunch. This lentil granola is one of my more unusual breakfasts. Lately I’ve been getting into using quinoa flakes instead of the cooked lentils. Chia seeds are awesome from a nutritional perspective given that they’re super high in Omega 3s, protein and gentle soluble fibre. One of my favourite ways to eat them is to soak them in some sort of liquid for a quick and very filling breakkie. Just combine 1/4 cup chia seeds with 3/4 cup milk, almond milk or coconut milk and allow to sit in the fridge for at least 1/2 hour but up to a few days. The longer it sits the thicker it will be. I like to eat it straight up but it’s also good with berries and some yoghurt. For more on chia seeds see 13 things you should know about chia seeds. Chocolate for breakfast? Healthy? If you’re struggling with this concept check out ‘Can Chocolate for Breakfast Be Healthy?’ and while you’re there try out the Chocolatey Coconut Granola Recipe. Now that it’s winter here, I’ve been feeling torn between the urge to have a super warming bowl of porridge and to keep my breakfasts high in protein. So I’ve come up with a solution that I call protein porridge. I take 1/3 cup quinoa flakes and mix with 2/3 cup milk. Then just simmer for a few minutes until thickened and remove from the heat. Stir in a beaten egg and cook for just a few more seconds. Serve with your usual porridge favourites. If you can’t find quinoa flakes, rolled oats will work instead. Have a look at my 6 slightly unusual healthy breakfast ideas. I call these ‘paleo’ in inverted commas because not all paleo gurus allow chia. So while they’re not strictly paleo, I’m happy to eat them on a regular basis. Because they’re egg based, rather than flour like regular pancakes, they’re gluten-free. They’re also really sensitive to being overcooked so you need to watch them very carefully. UPDATE: A Stonesoup reader emailed me to ask if almond meal could be used instead of the chia seed bran. So I tried it on the weekend and it was a big success! So for a real paleo version, replace chia seed bran with 4 tablespoons almond meal (or other nut meal). 1. Heat a small frying pan on a medium high heat. 2. Whisk together eggs and bran in a small bowl. 3. Add a little oil to the pan. Add egg mixture and cook for about 2 mins first side or until the egg looks set around the edges. 4. Carefully turn the pancake then cook for another 1-2 minutes or until just cooked through. 5. Serve asap with aioli or mayo on top and salad greens on the side. sweet pancakes – cook in unsalted butter instead of the oil and serve with your favourite sweet pancake toppings instead of the aioli and salad. I love them with a big dollup of double cream and a drizzle of honey or maple syrup. no chia bran? – Replace with 4 tablespoons almond meal. Oat bran works really well as a substitute (but isn’t paleo!). Other bran like wheat bran would probably be fine. Don’t try this with psyllium though. other chia options – if you can’t find chia seed bran, ground chia will work as a replacement. I’ve tried it with whole chia seeds and wasn’t a huge fan of the texture. You could always make your own ground chia by whizzing the seeds in a coffee or spice grinder. What are your favourite healthy breakfasts? I’d love to hear about them in the comments below. I love my green (or pink) smoothies. Natural greek yoghurt, banana, seeds (pumpkin, sunflower, chia etc. whatever is in the cupboard) and then spinach or kale, or frozen berries…. all in the blender. Makes 2 days worth. Easy. I need to try these ‘paleo’ pancakes too – they look great! Would they work as a flat bread alternative for other meals? Breakfast is the most important meal of the day my Mum would say, she was so right and so are you. It fuels us up for the day ahead. My breakfasts in order of preference are: Porridge, made with rolled oats. Fresh fruit with plain yoghurt and some bran. Avocado on wholemeal toast, no butter! Boiled eggs on toast. Poached eggs with smoked salmon. Hash’m’Ghandi. Bubble and squeak. Variety is the key, some economy tips and dietary warnings, e.g. Hash’m’Ghandi is nutritional and economical, fruit juice is way too much sugar and not enough fibre, margarine is out of bounds,butter is better, not Quinoa(have a moral objection to eating those seeds – leave it for the Bolivians)etc, etc one could write a book on a good breakfast. :-) Emilija. Eggs for breakfast mostly leave me cold. Once in a while I like an omelet with feta cheese and Parmesan cheese, or maybe some homemade chorizo sausage. My favorite breakfasts these days are açai bowls, smoothies, and overnight oats. 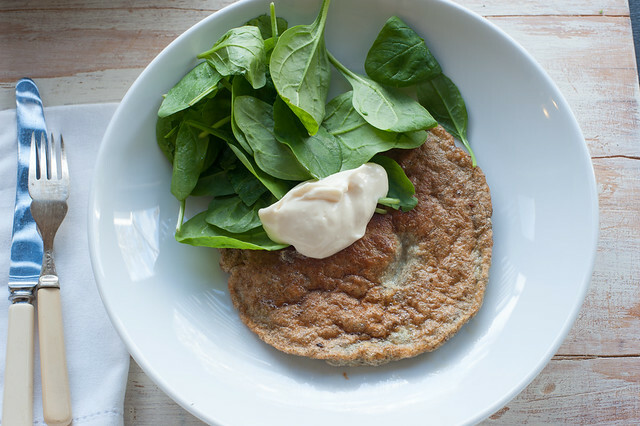 I don’t make them very often but I have a quinoa pancake recipe that is very good. I will be checking out your lentil granola – and the chocolate granola. Granola is what I always top our açai bowls with, and a new flavor is always welcome. I am someone who must eat 3 meals a day and breakfast would be one of them. Like someone said, it’s the most important meal of the day and fuels you for the rest of the day. It depends on the time of year as to what I will eat. In the winter I love Cream of Wheat with a little pat of butter. It warms my tummy when it’s really cold out. I don’t like it when it’s warm and humid. I also love pancakes. Mom makes the mix and yes, it’s from a box. It’s what we love. Almost any time of the year I love scrambled eggs and sometimes I will add cheese like cheddar or smoky gouda and some ham. My family says I make the best scrambled eggs. I love bacon with my eggs but don’t have that very often and I also don’t have pork sausages to often either but I love them too. I also like hash browns but don’t have them to often either. I like fried eggs too. In the summer I like Cherrios or Rice Krisipies too but when its cold I want a hot breakfast so I don’t eat cold cereal. Sometimes if we have some croissants I will put some scrambled eggs and ham on them, like some of those sandwiches they sell at the take away places. I love to eat! Some really great breakfast ideas here, which I’ll be trying, thanks a lot! I’m happy with muesli in summer, and porridge in winter, both served with yogurt and fresh fruit. My husband, however, loves variety at breakfast time so he’ll be very pleased with your suggestions!! Jules, do you think flaxseed meal would work instead of chia seed bran? 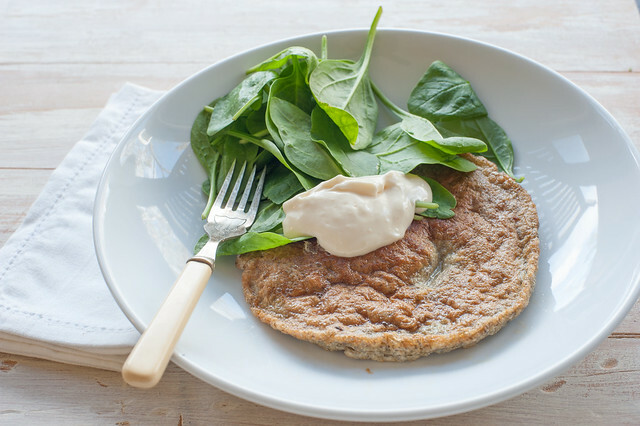 I’ve whole chia seeds in the cupboard but no grinder – I do however have the flaxseed meal & would be really interested to try these pancakes! How can you possibly eat these things for breakfast if you have a normal life? aAlso, the concept of paleo diets is utterly ridiculous. This is such a faddy blog. What great ideas! I have found that a protein, vegetable, fruit, and a carb are essential for my breakfast. I usually do eggs with spinach, an apple, and a slice of wheat toast. This keeps me full until lunch! Miso soup! Especially if I have extra tofu on hand. Thank you for the novel breakfast ideas, Jules! We have 2 favorites here: the first, “berry bowls”: one half or one third cup plain greek yoghurt, 1/2 c. berries (blueberry, raspberry, strawberry, or combination), 15 whole almonds, a squirt of honey, and 1 t. ground flaxseed. DELICIOUS! second favorite: Fried eggs on onion and cabbage. Saute 1/4 c. onion and 1/2 c. cabbage in about 2 t. olive oil. Throw in 3 pierced cherry tomatoes. When the cabbage begins to break down and/or starts to brown a bit, add 2-3 eggs. Turn the fire to med low. Cook 4 minutes and 30 seconds more if you’ve turned them. Can’t wait to try your coconut yoghurt! Keep up the good work! I just did the granula with red lentils. Wow! It’s already a favourite. Thank You!!! I am always struggling as to what to eat for breakfast and welcome your ideas which, being evening time here in Engand I have yet to try but will. My usual go to, as I live alone and can eat what I like, and being diabetic, breakfast is important to me. At the beginning of each week, when I have older mushrooms to use up, I finely dice the mushrooms (though size is not so important), an onion, garlic (amount – you choose). I put these in a bowl and in my halogen oven I will grill small pieces of diced pancetta or bacon – which ever is cheapest. Then I add the onion and grill that for a few minutes until soft, using the bacon fat that is already in the pan. Then mix the mushrooms and garlic in well and cook those. I add herbs of my choice for flavour – mine is either oregano or marjoram for bacon though I bet that most people in the world would not have such a selection of herbs as mine – 72 at last count – then I will add freshly ground black pepper. When this is cooked then cooled it stores well in a small box in the refridgerator. I add a couple of tablepoons to a sachet of oats and a full sachet of milk and put it in the microwave to cook at heat through. Bliss. I like my porridge on the sloppy side.